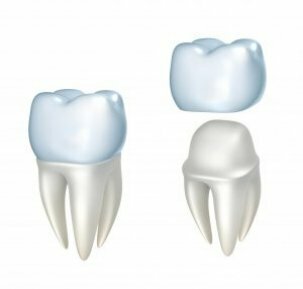 Crowns are porcelain molds that are used when the damage to a person’s tooth or teeth is beyond repair. For teeth that have been broken or severely misshapen, we can replace part of the tooth with a crown to restore comfort and improve use. In worst-case scenarios, we can create entire artificial teeth to fully replace a tooth that is missing or has been removed. Crowns are permanent, safe, and virtually unnoticeable from your natural teeth. They are the one of the best solutions for long-term correction of serious oral problems. They also improve bite, speech, and appearance for the patient. They are an exceptionally reliable solution for teeth that have been damaged, broken, knocked out, or simply fell prey to wear and tear, age, or disease. Sometimes, teeth develop tiny fractures or breaks from use. Often, this causes unexplainable discomfort to the patient. Crowns can often relieve this pain, as the pressure on the fracture is relieved. Crowns are also an effective treatment for front teeth that are chipped when veneers are not a possibility. The process does require multiple visits. Upon first examination, we will determine which teeth and to what extent crowns are needed. At that visit or the next, we will remove any decay, prep the tooth, and give you a temporary plastic crown until your molds are finished. Then, when the crown is ready, we will fit and cement the crown permanently into place. Usually, we will have a checkup after you’ve worn your crowns for a while to ensure fit and comfort. At Downtown Dental Services, our goal is to provide you with high quality services that repair not only the health and functionality of your mouth, but ensure you feel satisfied with the feeling and appearance of your teeth and smile. For patients with extreme dental problems, our experience with crowns will give you peace of mind that your new smile will be the picture of oral health.